For the ultimate specialized burnisher, see our Parker 51 tool kit for removing dents from 51 caps. Look under "Tools" / "Tools for Parker Caps" and YOU WILL FIND DENT REPAIR TOOLS FOR MOST PARKER METAL CAPS AND SOME BARRELS, INCLUDING 51s, 75s, VPs, BALLPOINTS, AND PENCILS. 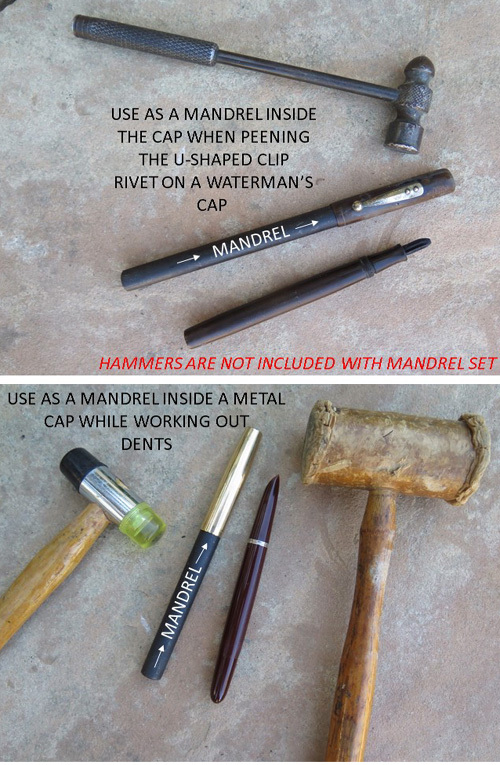 ITEM #MMS: MULTI MANDREL SET. 28 DIFFERENT DIAMETER STEEL RODS IN INCREMENTS OF 1/64" FROM 3/32" TO 1/2" PLUS 17/32". This set comrises one of my favorite tools for working on pens. It's a great aid for burnishing dents out of metal caps and barrels; you can usually come close enough to the size you need to fit into your piece and roll or hammer dents out (using a soft hammer, of course). These rods also work well as the roller when burnishing. I've also used these with a little heat to straighten out plastic caps and barrels. Another thing they work great for is in the roll of a mandrel (clamped into a vice) for use when peening over the "U" shaped rivets used on a Waterman's clip. One end of each mandrel is flat and the other side has a small point, but the mandrels are not tapered; the sides are parallel. Mandrels are 4 3/4" long. ITEM #RAWHIDE: THIS RAWHIDE MALLET IS A GREAT COMPLEMENT TO THE 51 CAP DENT REMOVER (ABOVE). While the cap has the mandrel in it, besides rolling the dents out, they can be gently hammered out with this soft but firm mallet. This helps a lot with "sharper" dings. ITEM #SOFT HAMMER: PLASTIC/RUBBER HAMMER FOR WORKING 'SHARPER' DINGS OUT OF CAPS WHILE USING A MANDREL INSIDE THE CAP. The knock-out block holes range from 3/16" (4.7mm) to ½" (12.7mm). The hollow punch (included) is designed to fit over every Sheaffer, Parker, and Eversharp fill tube I could find. The fill tube is a thin tube projecting from the back of the feed which would be destroyed by a solid punch when using a knock-out block. Knock-out blocks found in early Parker tool kits used these hollow punches, but mine will accommodate fatter fill tubes while having the sam eouter diameter allowing these to fit into smaller sections as well as the large ones. This improved design punch received rave reviews by Susan Wirth. ITEM #HT-F: METAL BURNISHING TOOL WITH VARIABLE SHAPE. This tool has a variably shaped tip depending on how it is rotated. This makes it useful for removing various sizes and shapes of dings out of metal pen barrels, caps, and nibs. It provides best results when the work is placed between it and a curved surface representing the desired curvature. This is my favorite, most used tool. . Made from very rigid metal, very difficult to bend. ITEM #HT-H & HT-J: WIDE BURNISHERS FOR REMOVING DENTS FROM METAL SURFACES. Available in 2 widths, as shown. These each provide 2 different curved widths per tool. Please specify HT-H or HT-J as shown in the picture when ordering. The numbers in the pictures indicate the width of each end of the tool. Made from very rigid German stainless, very difficult to bend. ITEM #HT-E: LARGE BURNISHER, .27" (7mm) WIDE. Also usable as a large sac scraper (Sac remover) for large pens such as Duofold Seniors. Made from German Stainless steel.